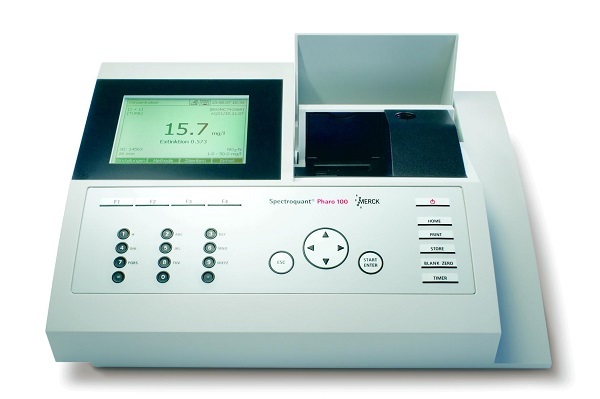 The Merck SpectroQuant® Pharo 100 and 300 spectrophotometers can measure Chemical Oxygen Demand (COD), a commonly analysed parameter in the water and environmental laboratories. COD is important as an indirect indication of the amount of organic pollution in water and is a useful measure of water quality. The test works by using fixed amounts of oxidizing reagent and sample. Once mixed and the reaction is complete a single wavelength measurement on the spectrometer is used to determine the residual oxidant remaining. The final result is expressed in milligrams per litre (mg/l) or parts per million (ppm). Once a laboratory starts to process reasonable numbers of COD tests, aligning sample identities to results and writing up the results becomes a bit of a chore. Of course the COD sample tubes could be further labelled to uniquely identify them, and automation with robots could be employed. However these all take time and are potentially expensive for what is a routine assay. There is also the problem of transcription errors that may occur and also as samples are often diluted there is also the potential for calculation errors to be introduced. So the challenge we had was to find a simple way to make sure samples are correctly matched with their results at the same time as eliminating any results transcription. We used Links for LIMS in a simple workflow where a direct connection (serial) to the instrument is able to capture live results during measurement. Links for LIMS downloads a worksheet from LIMS to obtain details of the samples. Once the reaction is completed the tubes are ready for measurement. Each tube is placed in the instrument one by one and Links for LIMS captures the result displaying it ‘live’ on screen. If you are doing COD testing and you are looking for a simple but effective way to process your results please feel free to ask us for more information at our Enquiry page. You can also download CSols Links for LIMS brochure for further details.